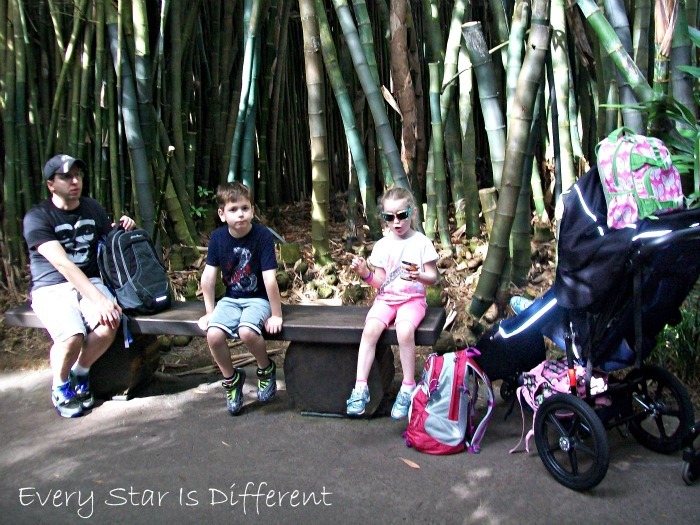 Our day in Animal Kingdom Walt Disney World with Special Needs definitely had it's ups and downs. There were some struggles that were expected and others that completely surprised us. Still when looking back on our trip, I would have to say this was my favorite day. The third day of our trip was spent in Animal Kingdom. Once again we got a late start because I wanted to give the kiddos as much time to sleep as possible before our first scheduled fast pass. However that just meant waking up at 7 AM instead of 6 AM. The bus ride, security, and entrance into the park went quite quickly, taking an hour in total from the time we left our hotel. Dinomite was so excited about our day at Animal Kingdom. This made him just a tad more intense than usual. 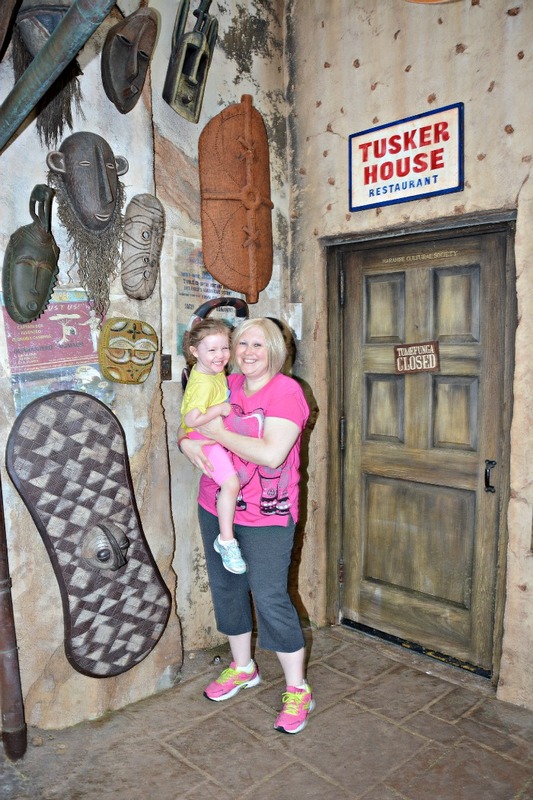 Our first fast pass was for the Kilimanjaro Safari. I forgot my camera, as I had left my backpack in our stroller, which was safe with all of the other wheel chairs guarded by cast members. Even if I had my camera, I don't think I would have had the time to take many pictures. Sunshine demanded a lot of attention. The safari itself was the best I've ever been through. We were lucky to see so many animals alert, awake, and moving around, up close and personal. 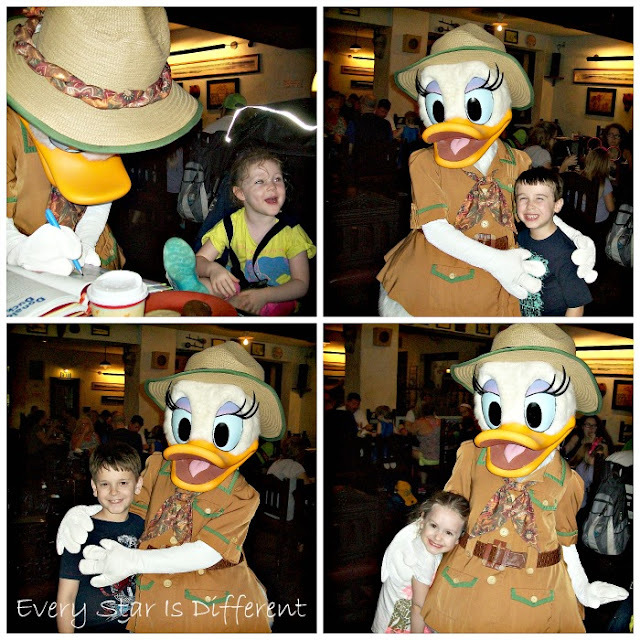 All of the kiddos thoroughly enjoyed it, even if Sunshine needed some extra attention. Once finished with the safari, we stopped to take a snack break before heading on our first trail. I was hoping that stopping to grab a snack would help to avoid burn out before lunch, like we had the day before. 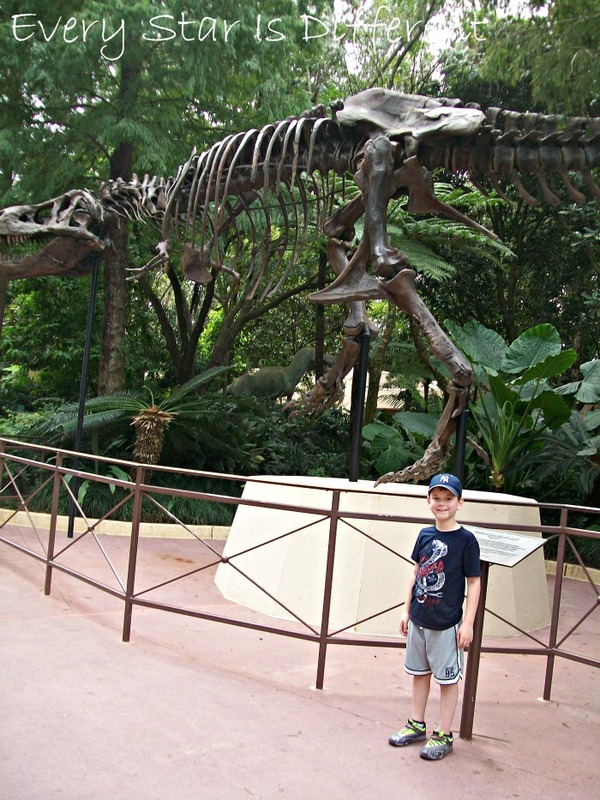 The Pangani Forest Exploration Trail was a highlight for Dinomite. He loved it. Sunshine on the other hand did not and required a bit more attention helping her through. Not too far into the trail I took the girls ahead and let Jason walk around with the boys. The girls and I were still able to see everything just at a faster pace. We had been warned trails would be packed with very little moving room. Those warnings proved to be accurate, and I think the main reason Sunshine was so uncomfortable. After our first trail came a potty break and then lunch. We ate at the Yak & Yeti Local Food Cafe in Asia. When it came to quick services on our meal plan, this one placed first in regards to efficiency, preparation and readiness for special dietary needs. There was still an extra wait, but it was much shorter than other places. The staff went above and beyond, carrying all of our food for us and finding us a table. The food itself was a win for all four kiddos. I personally didn't enjoy it as much as other meals, but Jason really enjoyed his meal. Dinomite continues to rave about the french fries he had. Bulldozer had a blast eating and feeding ducks that would come right up to him begging for food. Both of the girls ate well also. After lunch the kiddos were ready to head to Dinoland U.S.A, part of Animal Kingdom. Our first stop was the play area in the Boneyard. Thanks to our wheelchair tags, we were able to bring the strollers right into the play area, so if needed, we had quick access to them. Jason took the boys, while I stayed with the girls, but eventually we did end up all together, climbing, sliding, and doing much more. You'll notice Sunshine's shorts wet in these pictures. She decided to dump her water bottle all over herself. 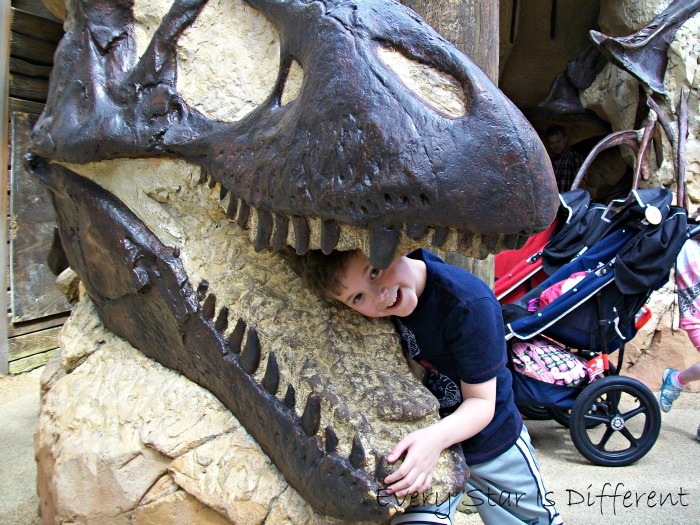 Once finished with the play area, Dinomite stopped and asked me to take a picture of him inside this dino mouth. He had so much fun posing. Lol. Of course Princess needed to do it too. 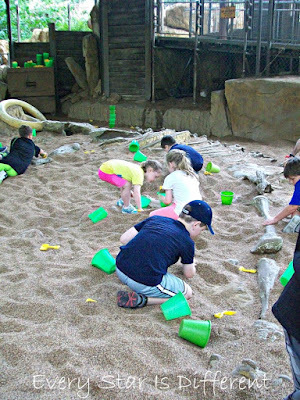 Originally we had planned to go right to the dino dig site after the play yard but we couldn't quite figure out how to get there. 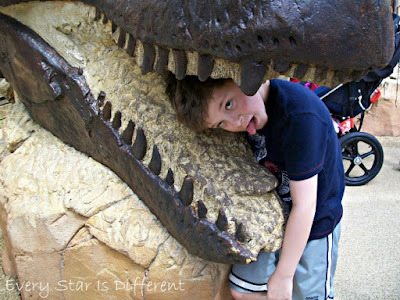 Instead we took a side route to see the amazing Dino-Sue. This was number one on Dinomite's priority list for the day. Lol. 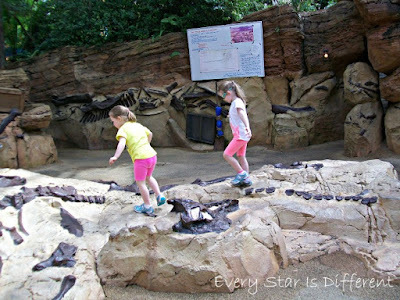 Eventually we did find the area where the kiddos could dig up fossils and just play. They had the time of their lives there. Jason and I were thrilled to have some time to just sit and relax. Sunshine did need her diaper changed while there, and thankfully Daddy took care of that, but for the most part the kiddos played and we chilled for about an hour. 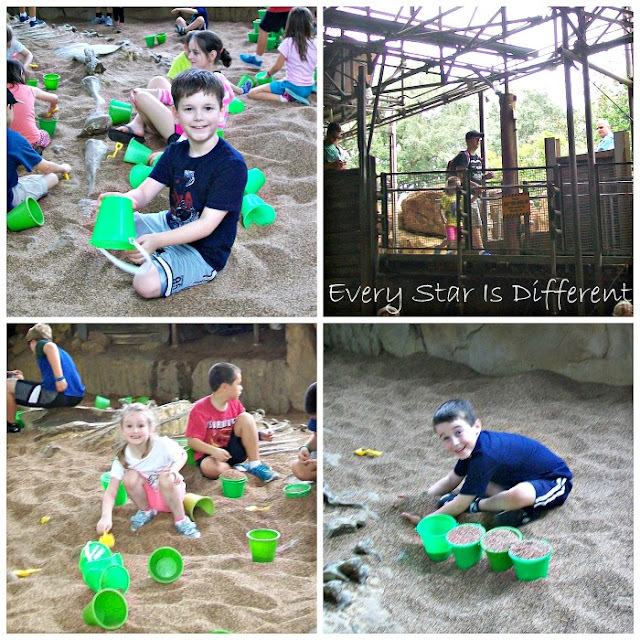 After the dig site the kiddos had a choice to make. We could choose to go to Finding Nemo-The Musical, which we had fast passes for, or they could go and meet Pocahontas. I knew we wouldn't have time for both before dinner. 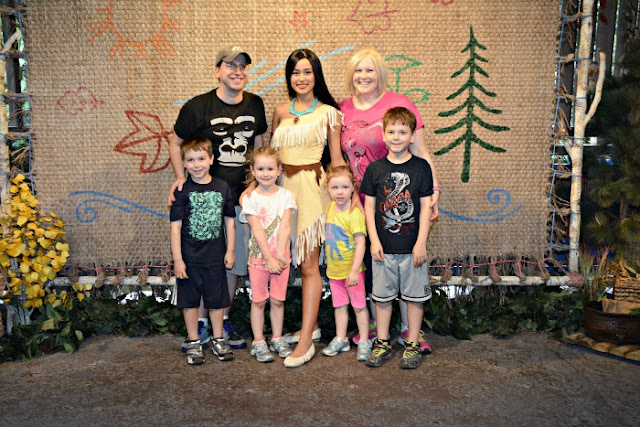 The kiddos chose to meet Pocahontas, all but Dinomite. Majority vote won, which he wasn't too pleased about, but it all worked out in the end. 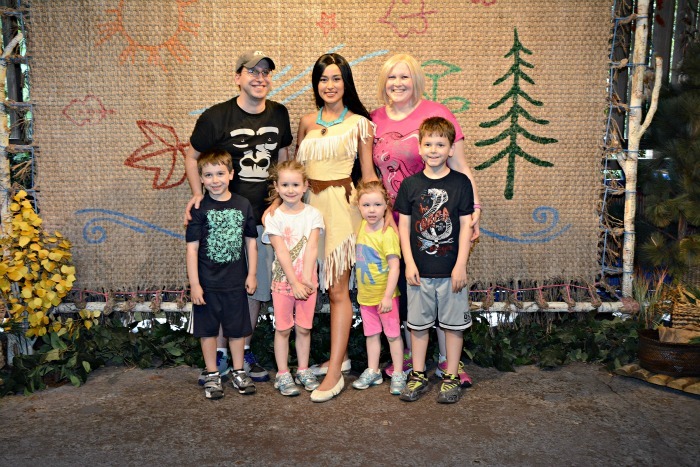 The wait for Pocahontas was about 45 minutes, I won't lie. But it was worth it in my mind, as I'm sure you'll agree after seeing the pictures. 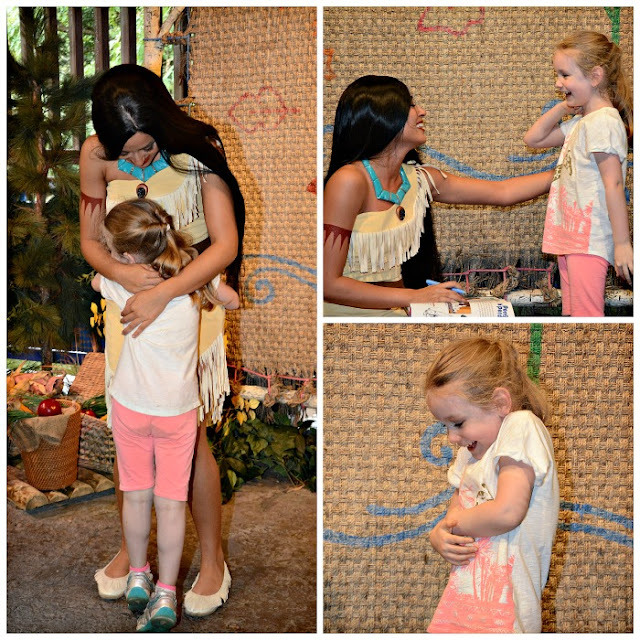 I'm not sure who enjoyed who more, Princess or Pocahontas. The two giggled and giggled. It was such a special moment. 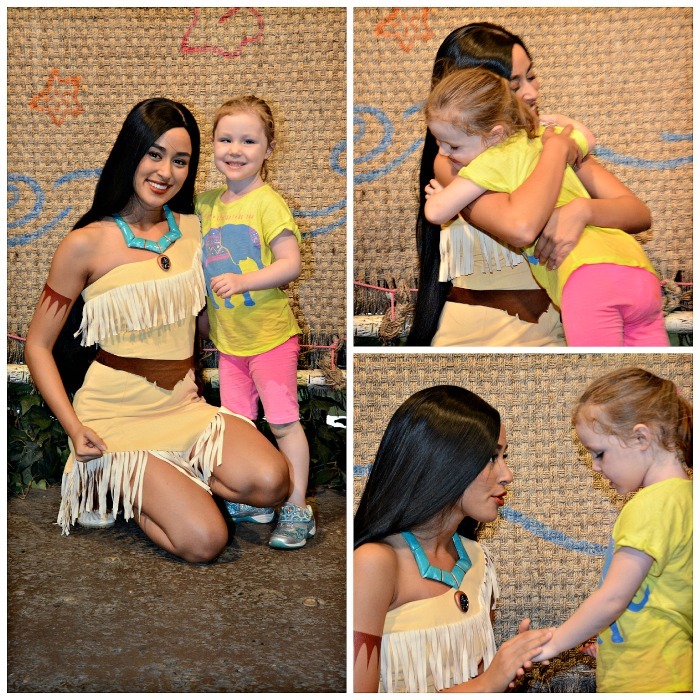 Pocahontas has always been one of the kiddos' favorite princesses. She really left an impression on Princess. And Bulldozer... He was totally smitten! 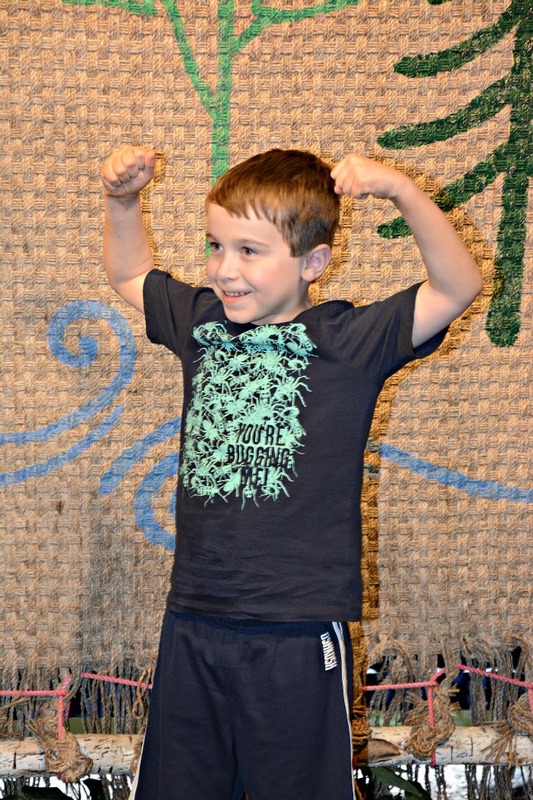 I just LOVE this shot the photographer captured of him while with Pocahontas, demonstrating his strong warrior pose, as suggested by Pocahontas. Dinomite refused to meet her on his own, but did agree to a family photo that turned out quite nice. The day before, I had been disappointed that we hadn't stopped to get many family portraits taken. I had told Jason that if we saw a photographer I wanted to be sure to stop. I had paid for the Memory Maker package and wanted to be sure to take full advantage of it. After our visit with Pocahontas, we saw a photographer without a line in front of the tree of life. This is by far my most favorite portrait of our family on the trip! The resolution is low on the blog, but the real photo looks amazing. For all those dying to see the full view of our amazing handicap strollers, here it is! 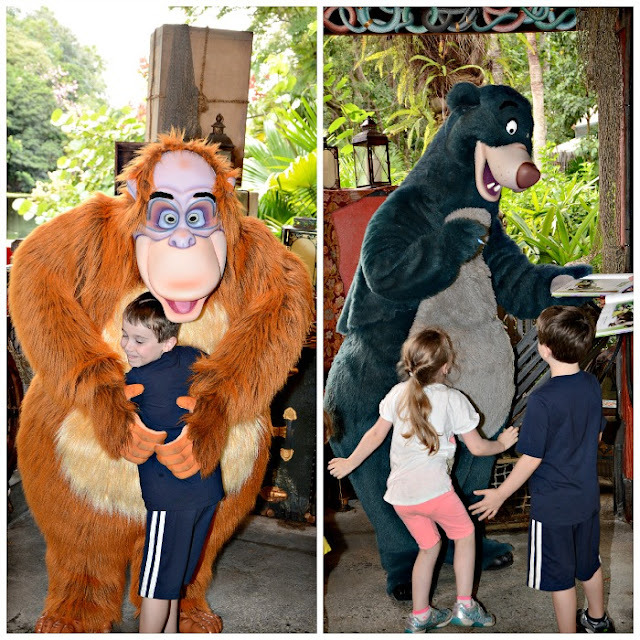 We still had a little bit of time before our dinner reservation, and just happened to see a very short line to meet Baloo and King Louie. 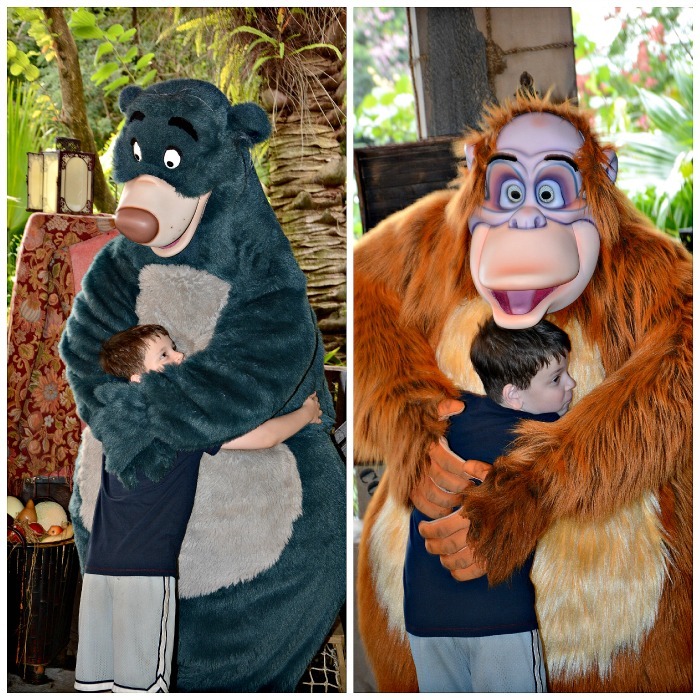 The boys are huge fans of Jungle Book. 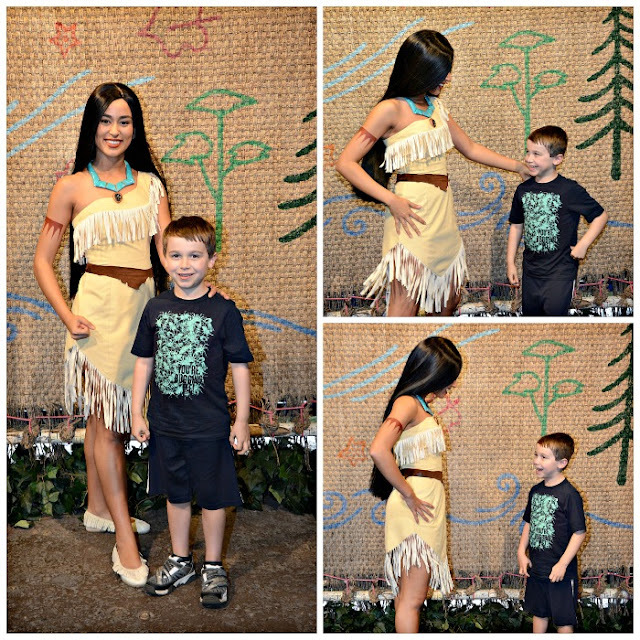 With Dinomite's new found love of characters that don't talk, we couldn't pass up the opportunity. 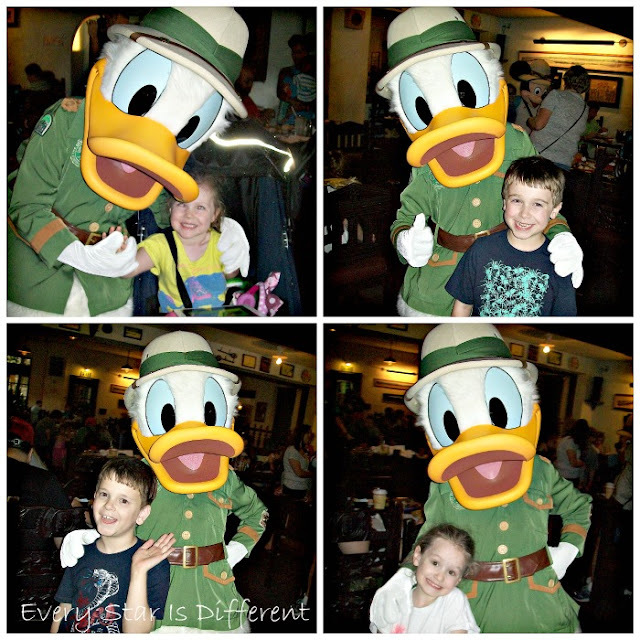 The meet and greet process with these characters was a little chaotic, but it all worked out in the end. And of course we couldn't pass up a family photo! While waiting to be seated a photographer was around and captured another shot of the family. At this point Bulldozer was done with pictures, as you can tell. 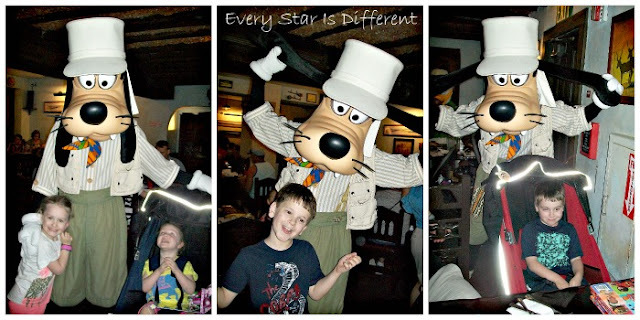 Dinner at Tusker House Restaurant, didn't really turn out as pleasant as we had hoped. Sunshine was not behaving well at all. It took a lot of energy to keep her kind and calm. At one point I had to take her out of the restaurant. While outside, the same photographer snapped a few shots for us. When we first arrived at the restaurant we were bombarded by characters, one right after another. It was yet another marathon of sorts. The kiddos enjoyed it though, so it worked out. 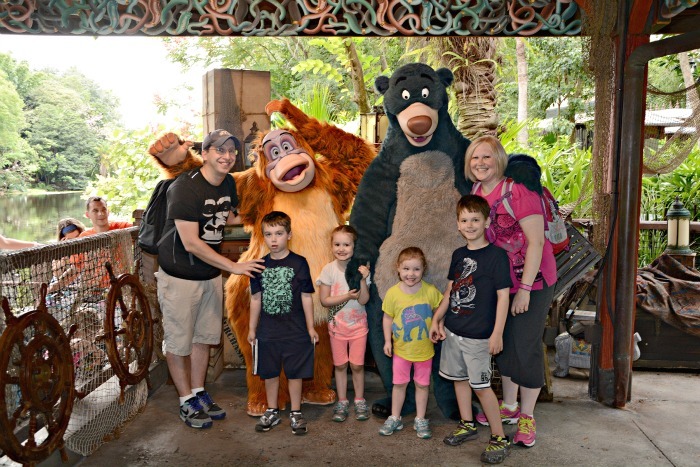 After the chaos with Baloo and King Louie I made sure to specify to the characters that I wanted an individual shot with each child. Other than Princess deciding to NOT stay in her seat, it worked out pretty well. 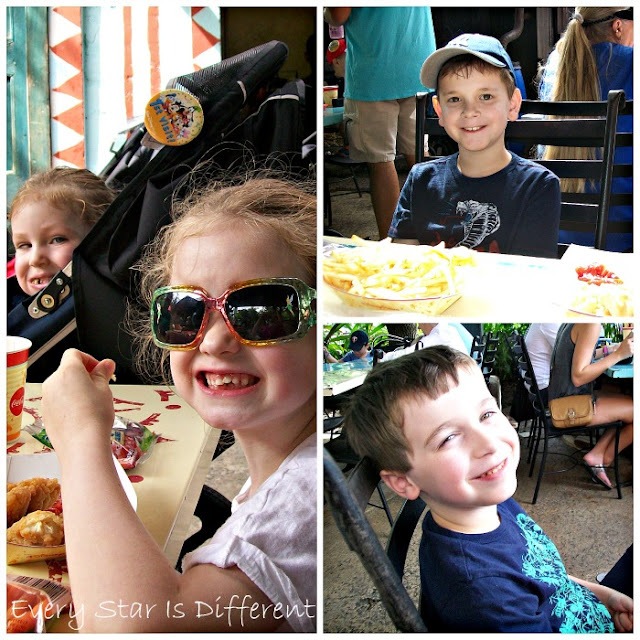 You can tell by the kiddos' smiles they really do enjoy character greetings despite the chaos during meal time they create. With that said, meal time character greetings are MUCH better than having to wait forever in line to meet characters in other places in the parks. For Bulldozer and Princess who hadn't met Mickey and Goofy at Epcot, it was especially fun to meet them for the first time here. All of the characters signed the kiddos' autograph books as well. In between characters and behaviors from Sunshine, Jason and I did get to quickly sample some of the delicious food at this restaurant buffet, but definitely not as much as we would have liked. Dinomite was also having major issues with his food here. The poor chef was bound and determined to find something that Dinomite would eat, but he had no clue what he was up against. Jason and I both left a little discouraged. Even more frustrating was that our magic bands weren't working correctly and a $220+ meal had to be charged to our hotel room. I was not a happy camper. After dinner we had our last fast pass scheduled for the Festival of the Lion King show. Due to our wheelchair tags, we were one of the first seated for the show and in the very front two rows. 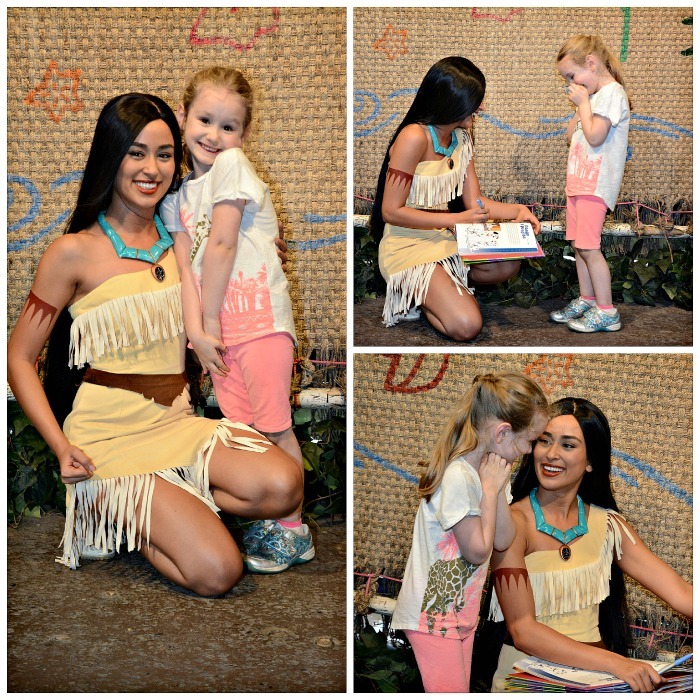 Shortly after others were seated, a cast member came and asked if Princess would like to help her teach the entire audience the hand jive. And so she did! I was impressed with how well she did. She had just learned it herself this winter. After a very difficult meal, the night certainly ended on a high note. The Festival of the Lion King show was AMAZING. I can't rave about it enough. It was everyone's favorite show by far. And as far as sensory experiences go, it was a big one. Surprisingly the kiddos did very well. Sunshine used the iPad with her Minnie Mouse headphones to keep her occupied when she needed it. The others were so focused on the show, they didn't need any other distractions. A couple wore their sound blocking headphones but that was it. The only minor issue we had was when the fog machine came on. Princess and Sunshine saw the fog coming right towards them as we were in the front and had no idea what it was. Lol. Once they understood it, they seemed to calm down. As if teaching the hand jive to the audience wasn't enough for Princess, both Dinomite and she were selected to be a part of the show in the parade of instruments. 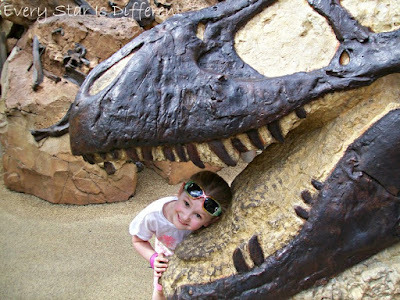 Dinomite refused, but Princess did go up and have fun. I was a little sad Bulldozer hadn't been asked to participate, but Jason said he was upset that Princess and the other kiddos weren't using the instruments the right way, so it probably wouldn't have gone well had he been chosen with his black and white mentality of thinking. 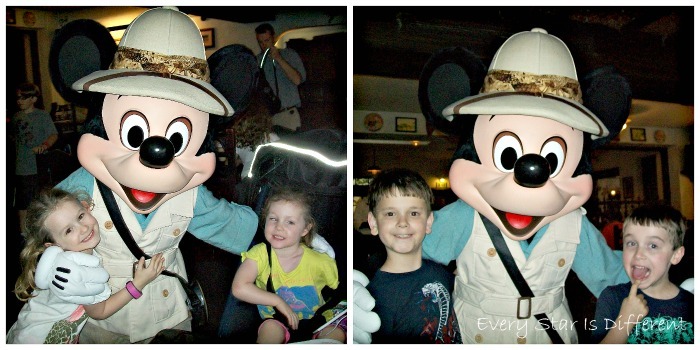 Disney World gives pictures of various shows when you purchase memory maker to have and use. I'm thrilled to show you some beautiful pictures of characters from the show! Not only did they have amazing costumed dancers, but the characters were fabulous! Animal Kingdom closed earlier than the other parks at Disney World, so we were heading back to the hotel at around 7 PM. Dinomite was devastated that we had to leave the park so early. All of his intensity from the day turned into a meltdown that lasted 2 hours. Dinomite's meltdowns are more like sobbing fits than anything else. But, they are very hard to manage, especially when you're trying to herd 4 kiddos to the restrooms, then bus stop, on to the bus, and back to the hotel. "I wish I could just live here and never go home." We did eventually make it back to the hotel. It had been our hope to take the kiddos swimming that night, but I had to take time to straighten out our bill for dinner and make sure our magic bands were working for the next day before we could do anything else and that took some time. Thankfully I met the kindest and most helpful cast member to help straighten out our dinner bill and magic bands. Not only did she make sure everything was working correctly, but she made sure the hotel paid for our dinner, leaving us with an extra table service credit to use on our stay. This was such a huge blessing, as we had one too many table credits per our meal plan while on vacation to begin with, and had already planned on paying for one meal out of pocket (just not this one). Now we didn't have to. The cast member that helped us was in a wheelchair herself, so I decided to ask her about the "right way" to utilize handicapped services on the buses. So far we'd unloaded the kiddos out of the strollers, storing them in the storage compartment below. Other times, the driver had told Jason to bring the strollers on the bus folded up, and he was expected to hold both of them himself, which is definitely easier said than done. Another driver loaded the strollers on the bus with the kiddos in them, strapping them into the handicapped sections of the bus. I had no clue which way was correct. All I knew was that the bus vs. stroller situation was challenging. Through that conversation I learned that we were to stand in the wheelchair line while waiting for the bus. If we were in that line, we would be loaded on to the bus first, before all others. A ramp would be lowered and the kiddos could ride in their strollers while on the bus, strapped and buckled in. Once we utilized this service, riding the buses was bliss! The kiddos were content and there was no rushing, fighting through lines, etc. And poor Jason was given a break. The same cast member helped me through the food court line at the resort to make sure our bands were working correctly. She also threw in a few fun treats for free. 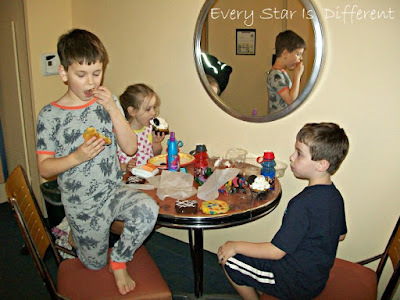 The kiddos were thrilled with their night time snacks before bed. Even after having returned to our hotel by 8 PM, the kiddos did not go to sleep before 10 PM. I'm sure part of this had to do with their evening sugar intake, but I was sure they'd collapse after two days of park fun. I was kicking myself for not remembering that when other typical kiddos usually pass out after loads of fun, my special needs kiddos are just more riled up. This was definitely the case while at Disney World. When they did finally all make it to sleep, Jason and I took a little time to unwind while packing bags for the next day. We finally made it to sleep around midnight. 1. If your children have a difficult time unwinding and settling in to bed, you may not want to schedule fast passes first thing in the morning, but instead take the time to rest. 2. Plan 90 minutes from the time you leave your Disney Resort room to the time of your first scheduled fast pass or reservation. This will ensure you can make it on time. 3. 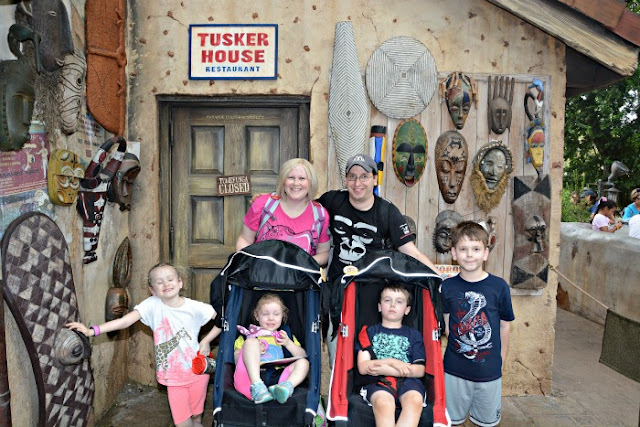 If your stroller is tagged as a wheelchair, you may use the handicap entrance and loading zones for all rides and shows. When you have children who struggle with walking and/or become physically aggressive when overwhelmed this makes a world of difference. 4. 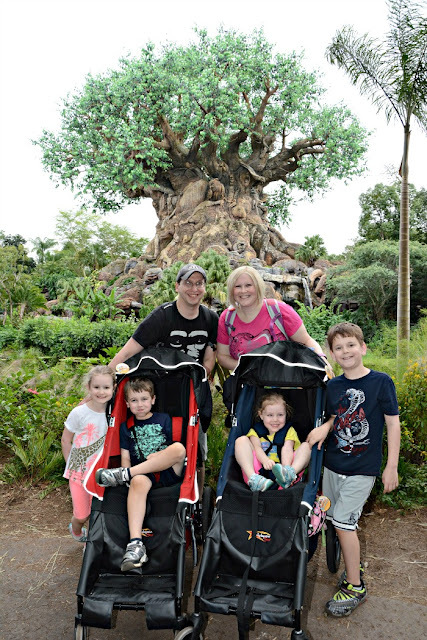 While on the trails in Animal Kingdom, snacks are not permitted. We obtained special permission for one snack, as we were unaware of this rule. Be prepared for this when you are walking the trails. 5. Trails are packed and crowded. 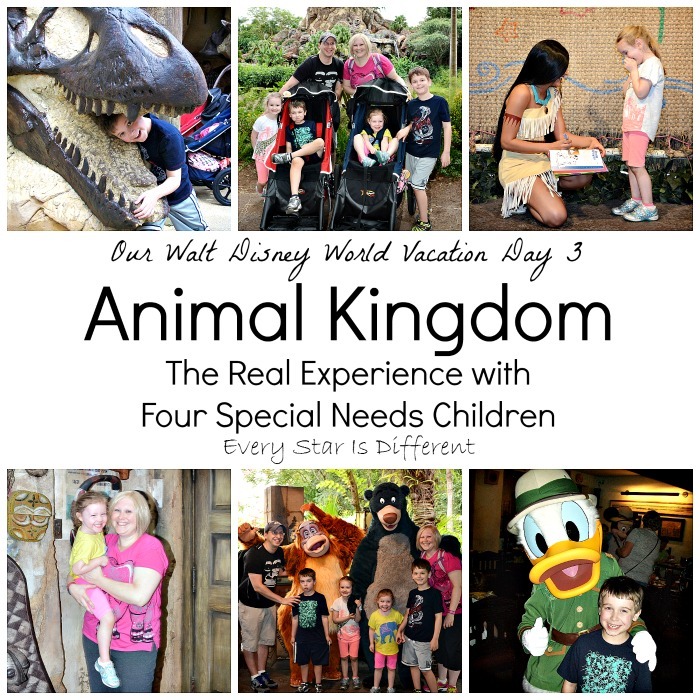 It is very difficult maneuvering a stroller, let alone an adult size stroller to see animals. 6. Even though quick service meals are supposed to be faster than table meals, when you have children with special dietary needs still plan about 2 hours from the time you enter the line until the time everyone has finished their food. 7. The Boneyard and Dino Dig areas are perfect places for kiddos to take a break, run around, and play. It also provides a great place for parents to take a break. 8. If you're planning to do character greetings, plan ahead and have things on hand for your kiddos to do. There are definitely characters worth waiting for if your kiddos can tolerate it. 9. Set up a plan for how you will handle character greetings, before characters arrive at your table or at a meet and greet location. If you have more than one child, will each child meet and greet the characters separately, or in a group, or both? Who will go first, second, third, etc.? Will autograph books be signed first or last, all together or separately? Planning all of this in advance will save you from dealing with so much chaos in the moment, when a character does arrive. 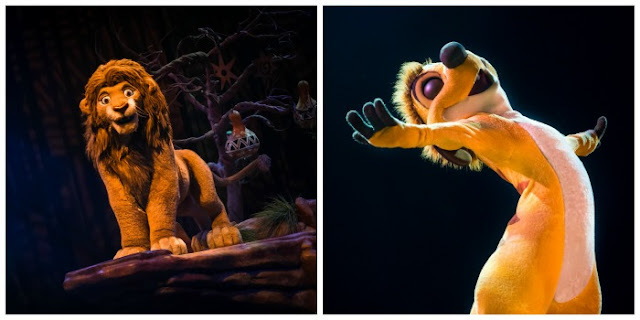 Characters always have a cast member with them. Share your plans with the cast member so they can help you. 10. When you are having difficulties with your magic bands while dining, issues will need to be resolved at your hotel when you return. Though very inconvenient, those we worked with were very helpful and went above and beyond to assist us. 11. 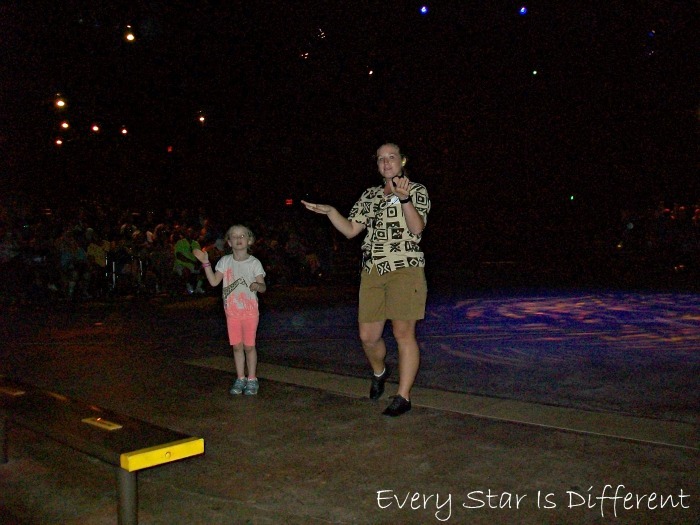 Be prepared for sensory experiences during shows. Watch youtube videos of them before you go, so you will know what assistance your children may need to stay regulated and enjoy the performance. 12. When preparing to go to any of the parks, you can usually plan for each ride or show to take an hour of your time with fast passes. Restaurant experiences usually take about 2 hours with special dietary needs. Plan your schedule accordingly so as to not overbook yourself. 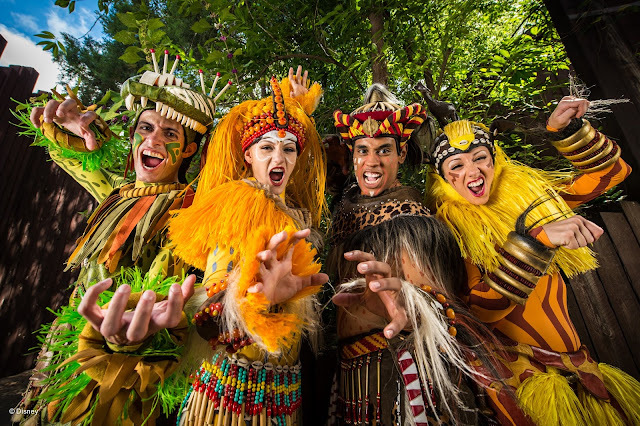 Many say that you can do and see everything at Animal Kingdom in one day. This is NOT true, especially if you have an animal lover and small children. We will definitely be planning two days next time we go. 13. 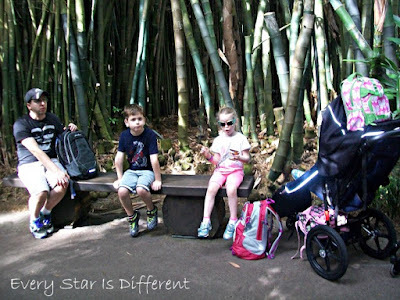 When using bus transportation to and from parks and resorts with a stroller that has been tagged as a wheel chair, wait in the line for wheel chairs, keep your child in the stroller and have their stroller strapped in and tied down. You will be the first to load and the last to get off, but the service is so worth it! 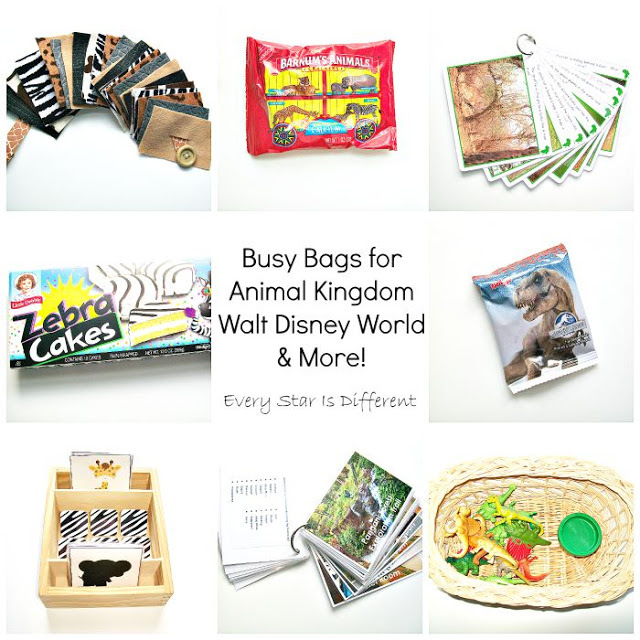 For those interested in busy bag ideas to use while waiting in line, at restaurants and shows, here's what we used. Busy Bags for Animal Kingdom, Walt Disney World & More! If you're planning a trip to Walt Disney World with special needs children and enjoyed this post, be sure to read about the rest of our time there. I'm really enjoying these blog posts. There is so much wisdom in them. I'll definitely be recommending them to others.